Apple is unique among America's mega caps due to the company's ongoing rates of revenue and earnings growth. From $108.25 billion in revenue reported in the fiscal year ended in September, Apple will surpass $170 billion in revenue this fiscal year and reach over one-quarter trillion dollars in revenue in FY2013. At a current market cap of $375 billion, the shares trade at about 14.5 times trailing twelve month earnings of $27.68 per share and at about 8.75 times my projected FY2012 earnings of $46 per share. Because of the company's frenetic rates of revenue and earnings growth, Apple is in an equity class all its own. Apple will deliver a third consecutive fiscal year of revenue growth above 50% and eps growth above 60%. This fiscal year's strong performance begins with what I call "Apple's monster quarter." 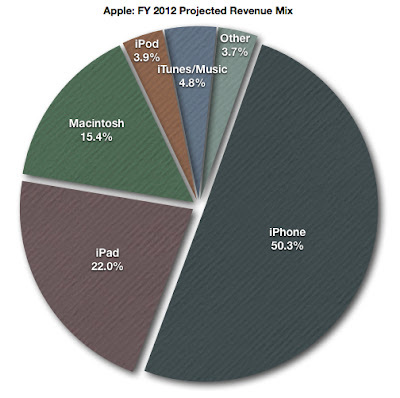 Apple's first fiscal quarter of FY2012 will be fourteen weeks in length. It stretches from September 25, 2011 to December 31, 2011. The additional week in the quarter will encompass the immediate post-Christmas period. The quarter also includes the initial release of the iPhone 4S in the United States and other launch countries. The additional shipping week, the new Sprint agreement for the iPhone and pent-up demand for the recently refreshed smartphone handset will deliver revenue growth greater that 60% in the quarter and eps growth exceeding 80%. The chart below illustrates how much the rate of Apple's share price appreciation has fallen behind the rate of earnings growth over the past four quarters. Despite the 82.7% growth in earnings per share in FY2011, at Apple's closing price of $403.33 on Friday, December 23rd, the share price has risen only 24.64% year-over-year. The dates selected for the charts in this article represent the first trading day of the month following the release of quarterly earnings and the closing price on Friday, December 23, 2011. In the famous novel by Charles Dickens, Ebenezer Scrooge is visited on the night before Christmas by Ghosts of Christmas Past, Present and Yet To Come. The story, which has endured many popular adaptations, ends with the conversion of a miserly and miserable man to a gentleman who carries with him the hopeful and generous spirit of Christmas to the end of his years. I have followed Apple since the release of the original Macintosh in early 1984. I have witnessed and written about the tragedies and triumphs of the company's past, its present and Apple's potential for growth in the years yet to come. Today I see a storied enterprise with a colorful past befitting its own novel, yet an enterprise that maintains a youthful, almost playful approach to the product strategies that will yield success in those years yet to come. I remember a time when the word "beleaguered" had become a de facto prefix to the company's corporate name. The company that many consider the first modern tech industry IPO and the company that claims to have ignited the personal computer revolution became stodgy and stubborn like the character in the Charles Dickens novel. In the mid-1990's Apple didn't lose its leadership in the PC market because Windows PCs were better. Apple lost its leadership because the CEO at the time bet on the brand name rather than innovation to deliver revenue and margins. The Performa line of Macintosh computers nearly drove the company to oblivion. It was a twist of fate and a combination of products for content creation and content consumption that reversed Apple's fortunes. The return of Steve Jobs, the nimble and diminutive iPod, the iTunes music store and a revamped line of personal computers sparked one of the great corporate revival stories of the past one hundred years. It was innovative thinking that started Apple and it's the continued spirit of innovation that recently delivered the company's first $100 billion fiscal year. Although Apple has invested heavily in building global brand awareness, innovation is delivering record revenue and earnings, not the brand name. Apple has learned from its ghosts of the past. For the holiday season of 2011, Apple released a compelling line of new smartphones and the company is a global leader in the emerging market for tablet-style products. This quarter Apple will generate revenue of over $40 billion and earnings of more than $11 per share. Contrary to popular opinion, Android handset makers compete more with one another than they compete with Apple. Apple's biggest challenges are maintaining the pace of product innovation and meeting demand with supply when refreshed products are initially released. Absent innovation Apple can not sustain strong rates of revenue and earnings growth. Only in the absence of adequate supplies of newly released Apple products can competitors establish or sustain a lucrative foothold in any of the company's primary product markets. On September 25th, Apple entered its current fiscal year with the strongest product line in the company's storied history. In a recent article titled Apple's 25% Solution, I provided an overview of Apple's extraordinary FY 2011 revenue and earnings growth performance, including the nearly 25% of recognized revenue that flowed to the net income line. Today I'm publishing my preliminary revenue and earnings per share estimates for FY 2012. For the current fiscal year ending next September, I anticipate 57% revenue growth to $170 billion and earnings per share growth of 66.2% to $46. In FY 2012, Apple will surpass HP in revenue to become the nation's largest technology company and maintain its position as the most highly valued enterprise in the industry measured by market capitalization. The graph below illustrates the percentage of revenue I anticipate each of Apple's major product lines will contribute to the $170 billion recognized revenue total. Before I delve into an overview of the anticipated unit sales and revenue performance for each of Apple's major product lines, mention needs to be made of the Apple iPhone as the company's growth catalyst. In FY 2012 I anticipate the popular smartphone line will represent 50% of Apple's recognized revenue and about 62% of the expected 57% rise in revenue. Almost 75% of Apple's projected FY 2012 recognized revenue will be derived from iOS-based products including the Apple iPhone, the Apple iPad and the iPod touch. Each of those products have been brought to market within the past five years. The Apple iPhone alone will deliver over $85 billion in revenue in FY 2012 or an amount equal to at least 130% of the company's FY 2010 recognized revenue total. Since the start of the new millennium, Apple has become among the nation's most highly valued enterprises measured by market cap, the world's largest distributor of music, a major global retailer and the biggest mobile device maker when ranked by revenue. Apple's rates of growth over the past six years have been so strong, in FY 2011 revenue surpassed $100 billion. By the end of the company's FY 2013 in September of that year, revenue will surpass $200 billion. This article is intended to assist readers in understanding Apple's recent and near-term rates of revenue and earnings growth. In the six fiscal years since FY 2005, Apple's annual revenue rose 677% to FY 2011's $108.249 billion. During this six-year period earnings per share rose an astonishing 1,686% to FY 2011's $27.68. To put the current rates of growth in perspective, in each quarter of FY 2011, revenue exceeded the company's total revenue of $24.578 billion FY 2007. Earnings per share in FY 2011 reached the combined eps totals for fiscal years 2006 through 2009 with over $5 per share to spare. Beyond doubt, Apple is an extraordinary success story of the early 21st Century. It was only ten years ago the first iPods came to market and it's been less than five years since the iPhone was initially announced. While understanding Apple's success seems simple when viewing six-year growth charts, over the past few years Apple's success story has become more complex. Make no mistake: Apple is primarily a hardware device maker. From beginning to end and at every spot in between, the company is focused on the sales of hardware devices and the development of high margins on products sold. 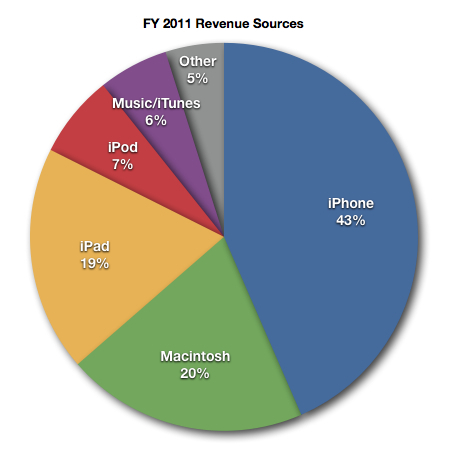 The nearly 25% of recognized revenue that flowed to the net income line in FY 2011 is what I call "Apple's 25% solution." It's Apple's formula for consistent earnings growth and management's solution to the complex questions that surround strategic product decisions. Although Apple is the world's largest distributor of recorded music, a major distributor of software through the app stores and a global retailer with 357 Apple store locations as of the end of the September quarter, these ventures are designed to boost device sales and provide competitive advantages in the company's device markets. iTunes, the Apple retail stores and other software and service ventures are constituent to device sales, they support high gross margins and efforts to differentiate the company's product in the competitive global marketplace. They have no other primary or secondary purpose. Apple has no major ventures or areas of operation that could be considered ancillary to the sales of hardware devices. 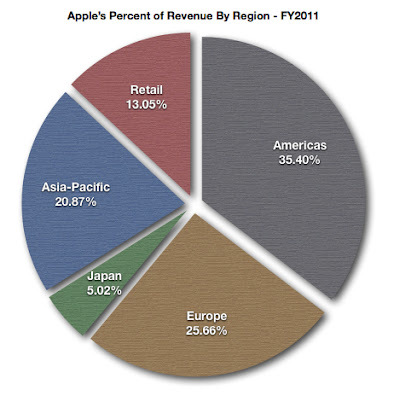 The graph below illustrates Apple's sources of revenue in the fiscal year ended September 24, 2011. Almost 90% of recognized revenue was sourced from hardware device sales. Sales of iOS-based devices (iPhone, iPad and iPod touch) represented close to two-thirds of the $108.249 billion in revenue generated during the twelve-month period. Revenue generated through iTunes and sales of software products such as Mac OS X, 10.7 represented just over 10% of revenue and this revenue is exclusively tied to the company's device sales efforts.